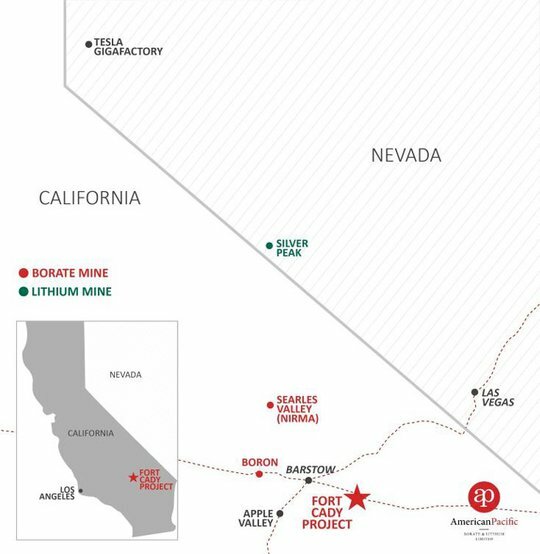 When ASX junior American Pacific Borate and Lithium (ASX:ABR) released an extremely positive definitive feasibility study (DFS) in relation to its Fort Cady Borate Project in California, there was a corresponding reaction from the market. News of its DFS saw the company’s share price increase by more than 60% from the previous day’s close of 14 cents to a high of 22.5 cents. However, the company isn’t resting on its laurels. As stated in its recent quarterly the total JORC compliant Mineral Resource Estimate was upgraded for the Fort Cady Borate and Lithium Deposit. This delivered a substantial conversion of the Indicated category into a Measured category resource of 120.4 million metric tonnes (Mt) at 6.5% B2O3 (11.6% Boric Acid equivalent [H3BO3]) and 340 ppm Lithium (5% B2O3 cut-off) for 7.8 Mt contained B2O3 (13.9 Mt Boric Acid). The revised Mineral Resource Estimate underpinned the DFS. The conversion from Indicated to Measured was supported by ABR’s testworks in 2018 with 72% of the total MRE contained within the Operating Permit region awarded to American Pacific subsidiary, Fort Cady California Corp. which solely entitles FCCC to commercial scale mining. This momentum is expected to continue following ABR’s latest release to market. 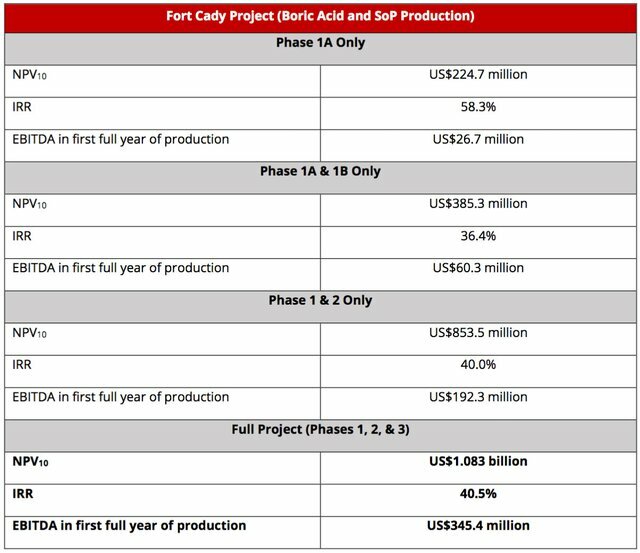 Just this week, ABR announced it has enhanced the Fort Cady Borate Project DFS to include a low capex starter project that works on a standalone basis. This important milestone has been achieved by splitting Phase One into Phase One A and Phase One B. 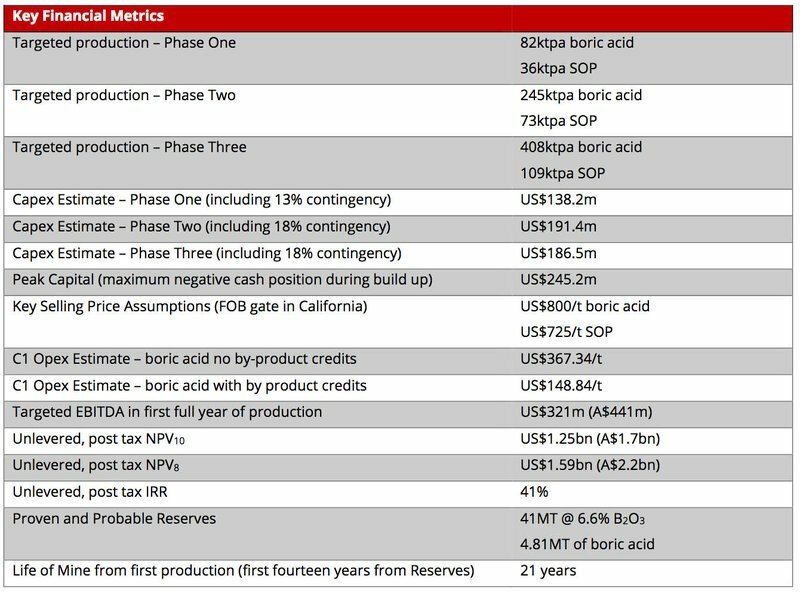 Phase One A will target the production of 40k stpa of sulphide of potash (SOP) (K2SO4) and 6k stpa of boric acid (H3BO3), whilst Phase One B will increase boric acid production to 90k stpa using learnings from initial 6k stpa operation. There are exceptional financial metrics for this starter project. What this means is that ABR now has a pre-production capex of only US$36.8m and a pathway to Phase Three with an annual EBITDA in the first full year of production of over US$340m. In essence, the Fort Cady Project is an outstanding boric acid and SOP project driven by low upfront capex, high margins and low technical risk. With metrics like these, the company is hoping the Fort Cady Project will be easier to finance, will limit likely share dilution and preserve a massive EBITDA target in full production. Its ability to include such a low capex starter project emphasises how unique the Fort Cady project is in the world of mining. With that in mind, let’s take a closer look at the Ford Cady Project and the strength of ABR’s DFS. As you can see, the ground is well positioned. Close to the famed Silver Peak mine which produces 3,500 metric tons of lithium per year, with the capability to produce 6,000 metric tons. Abermarle’s (capped at $8.5 billion) Silver Peak mine intends to increase its production as lithium demand increases. This is a highly likely scenario given the increase in consumption of smart phones, tablets, battery tools and the rise in electric vehicles. Note, Tesla’s Gigafactory is also on the radar. Tesla and Panasonic are making batteries and battery packs at the Gigafactory in Storey County, whilst the rise of tech companies in the region continues at pace. 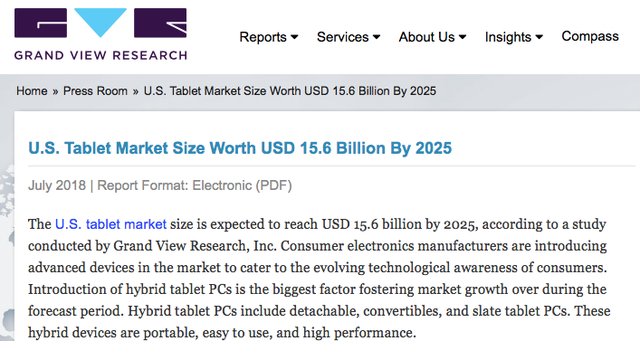 According to data compiled by Grand View Research, the global lithium-ion battery market is projected to reach US$93.1 billion by 2025 while growing at a CAGR of 17% during the forecasted period. Of course, that is lithium, but what about borate? ABR recently highlighted global supply and demand data from multinational borate producers that indicates demand will continue to grow. Borates are used in everyday applications and the resilient agricultural industry and these key markets are expected to grow as global population increases and a new middle-class emerges in previously impoverished countries with large populations. There has also been a divergence of demand for borates driven by the construction and glass industries. China is a key market for growth and recently ABR invited a major state-owned enterprise, Sinomach to visit the project and continue strategic co-operation discussions, but demand is also expected within the US, India and the European Union, which again is an advantage for ABR. Borates tend to be a high-margin industry, but key factors for success are the ability to mine and mine proximity to infrastructure – areas where ABR has a distinct advantage. In the absence of boron resources across Asian countries and taking into account the constant and growing demand for its glass and ceramics, borate producers should continue to benefit from increasing demand. This all bodes well for the $32 million capped ABR and its shareholders as ABR has its hands on a highly impressive project. It was these very factors that prompted ABR to increase its mine size late last year. ABR is targeting a substantial EBITDA of A$479 million (72c exchange rate) in its first full year of production. That’s an impressive number, which makes Fort Cady a significant mining project in a low risk, supportive jurisdiction. There’s also the net present value of A$1.7 billion (10% discount rate) to consider. What is important to note here, is that the DFS points to a mine life of 21 years with an unlevered post-tax internal rate of return of 41%. The capital expenditure required to deliver Phase One of the project was US$138.2 million. With the recent update Phase One has been split into the starter project of US$36.8 million (Phase One A) and the second half with a capex of US$111 million (Phase One B). Management expects to start construction in the December quarter of 2019. Here’s a look at the financial metrics of the DFS. The fundamentals point to an extremely lucrative project. The good news is that pricing assumptions and other data appear conservative with boric acid currently fetching around US$900 per tonne compared with the US$800 per tonne used in the DFS. 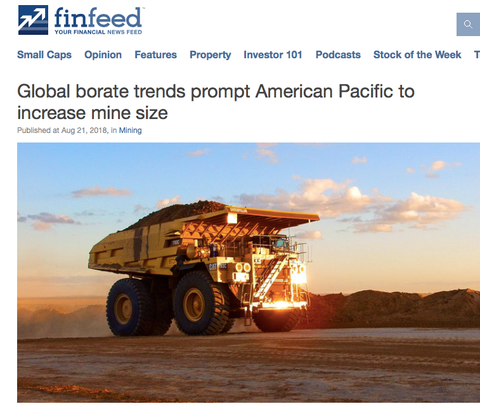 This implies strong margins relative to the DFS estimated operating costs of approximately US$370 per tonne prior to taking into account by-product credits, with the latter significantly reducing costs to around US$150 per tonne. All of this brings us to ABR’s latest news. As mentioned, the creation of a starter project has been achieved by splitting Phase One into Phase One A and Phase One B, and this has many benefits. Pre-production capex is reduced from US$138 million to only US$36.8 million. To state the obvious, that is an initial capital reduction of over $100 million. The project also delivers exceptional financial metrics: it is financeable on a standalone basis. What all of this points to is a potentially lower share dilution whilst preserving the targeted economics and valuation of the larger project. ABR will use these learnings for the small-scale commercial boric acid operation to ensure the larger boric acid operation is optimised from both a construction and operational perspective. The overall results of splitting Phase One into two distinct projects, is that pre-production capex has been reduced by around 75% whilst total capex has only increased by around 7%. This frees ABR up to target finance on this project in isolation and creates a sensible pathway to full production. It also creates an EBITDA target in the first full year of production of US$345 million. Here’s a summary of the production targets by each Phase of construction. And here is the initial DFS against the enhanced version, noting that no targets are changed including the mining and processing of boric acid and the life of mine. These figures are important, particularly when you consider the US is currently a net importer of SOP and the market is forecast to grow by 4.4% annually through to 2022. If the DFS upgrade wasn’t enough, ABR has a busy schedule ahead of it in 2019. Important upcoming milestones include progressing financing discussions, obtaining permits and the commencement of detailed engineering. Lowering upfront capital expenditure could generate earlier revenues. The following schedule sets out the company’s goals – some have already been achieved – while also providing investors with an indication of the timing of potential share price catalysts. It’s worth noting here that over US$60 million has been spent on the Fort Cady Project, including licence acquisition, drilling and resource estimation (non-JORC), well testing, metallurgical testing, feasibility studies and pilot plant infrastructure. In addition, the project has previously obtained all operating and environmental permits required for commercial solution mining operations. For now, note that 2019 could be a big year for the company as it continues to fast-track the project by making smart decisions that could have a significant impact on its market cap.